Want to know more about gardening? Whatever your reason for gardening, this course will help you to garden more efficiently and effectively. Basic Plant Identification & Culture: Plant names, planting, transplanting, tools & equipment. Soils & Nutrition: Soil structure, nutrition, composting, soil building, drainage, fertilizers. Pests & Weeds: Identifying problems, sprays, biological control, weed identification & control. 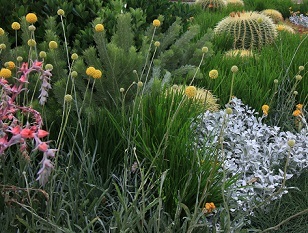 Landscaping: How to design a garden, rockeries, native gardens, traditional (European style) home gardens. Propagation: Propagating materials, seed, cuttings. Lawns: Turf varieties, laying a lawn, lawn care. Indoor Gardening: Hardy indoor plants, container growing. The Kitchen Garden: Vegetable gardening, fruit trees, herbs. Things fall or blow into gardens all the time. It doesn’t matter whether the problem is leaves and twigs dropping from overhead trees, or papers and plastic bags blowing in from the street, no-one likes to sit in a garden that looks really messy. Fortunately, keeping the garden clean is a lot easier now than in the past. Modern machinery, and a better understanding of garden design, have greatly reduced what was once tedious and, in a large garden, back-breaking work. There are several, very useful pieces of equipment, which can be bought or hired for quick clean-ups. These are popular for cleaning driveways, paths and paved areas, by blowing leaves and other light debris out of the way to where it is not such a problem. This might be onto garden beds, or into a pile where you can then easily pick it up and dispose of it appropriately (e.g in the compost bin or garbage bin). Both petrol or electric-powered models are readily available, and there are now some great battery rechargeable versions on the market. Petrol machines will be louder than electric-powered ones. Costs can vary considerably in terms of the quality of workmanship, size of machine and the warranty provided. These are great in autumn to clean up leaves or after a party. Vacuums work in reverse to the blowers by sucking up the debris into a collection sack attached to the vacuum (just like a vacuum used to clean your floors indoors). They can be bought or hired (like all other machines in this article). Petrol vacuums tend to be more popular as they tend to be more reliable and have a stronger ‘sucking’ force. Collections bags should be emptied when they are no more than one-half to two-thirds full (depending on the model) for best results. Water under pressure can be used to clean light and heavy debris from surfaces. The blast of water may be strong enough to lift stains and moss from old pavers, bricks and concrete. Water blasters are frequently used to ‘freshen’ up an old garden and the house especially when the owner is trying to sell the property or just as spring arrives.. These high-pressure water jet cleaners are either electric or petrol-powered. Most utilise cold water, although hot water use is available with some models. For an alternative approach, hose and irrigation specialist companies, have produced simple attachments for hoses that turn the normal water pressure into a fine jet of water under high pressure. Although these can work well for many home duties they are not as powerful as the water blasters. Build fences along the boundaries. On windy days these will catch most of the air-borne material, so that all you need do is a quick clean-up along the fence line after the wind has stopped. Avoid creating wind tunnels between buildings. Narrow passages between the house, garage and fence are particularly prone to becoming wind tunnels and, as such, are often full of papers, leaves and other debris. Avoid the use of light-coloured, paved driveways, and grey cement paths and driveways. Oil marks, tyre marks, algae and mildew will show up much more readily on light-coloured surfaces. Avoid using light-coloured hard surfaces in shady, damp areas, otherwise you’ll be forever battling mould, moss, mildew and algae growth and stains. Avoid locating gravel paths and driveways near trees, which drop a lot of leaves, seeds or twigs – they can be very difficult to rake out of the gravel. Don’t use sandstone, light-coloured concrete blocks, or similar materials around barbeques – the grease soaks in, leaving permanent stains. Use screen plantings along the boundaries to slow the passage of wind and to prevent rubbish blowing in. Avoid trees that constantly drop leaves and twigs. Although deciduous trees drop lots of leaves in autumn, that only occurs for a short period, and the leaves can be easily raked up and composted. The real problem is those trees that drop small amounts of leaves, bark and woody twigs throughout the year. Eucalypts are especially prone to making a mess, dropping lots of dry woody plant material, which is slow to compost. Similarly, palm fronds can be troublesome to dispose of. Avoid having plants that produce berries or other soft fruits overhanging lawn, hard-surfaced areas (such as paving), or garden furniture. The fruits can be a real clean-up problem, as well as posing a safety risk if people slip on them. Locate such plants in the middle of garden beds where the falling fruit will not be such a problem. Avoid having plants that drip lots of resins (e.g. some conifers), saps, or nectar from flowers overhanging hard-surfaced areas. Avoid planting shallow-rooted and short-lived trees in windy areas. Quick-growing acacias are notorious for toppling over in strong winds, and are potentially a major cleaning-up headache. In windy areas, use heavier woody mulches, such as bark, in preference to fine light mulches, such as lucerne or deciduous leaves. Keep the garden well watered. When plants are under stress they drop leaves as a survival mechanism. Wildlife in the garden (birds/possums etc) can break foliage, make a mess with fruit and berries, and drop faeces on paths and outdoor furniture. Keep trees that attract such animals away from paths, walls and other hard landscaping. Watch out for insects, which create a mess. Sooty mould – a black powdery fungus associated with scale insects and aphis – can mark hard landscaping features. If possible, treat infestations before they get out of hand, and avoid planting hibiscus, citrus and other plants susceptible to such problems near paths, furniture, etc. You might be amazed how much time and effort you can save maintaining your garden, by following some of the simple design tips from above, and by using the right equipment to help you clean up when it becomes necessary to do so.